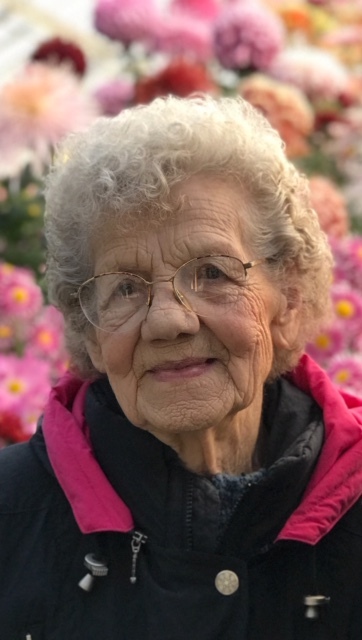 Easthampton- Sophie Dorothy (Plaza) Swiercz, age 95, of Federal Street, died peacefully on Thursday, January 10, 2019 at Bay State Medical Center in Springfield following a brief period of illness. Following her military service, she returned to Easthampton in 1946 where she met and wed the love of her life and husband of 64 years, Tony (deceased, October 2010). She was a devoted wife, mother, grandmother, neighbor, friend, and caregiver. An avid fan of her grandchildren’s sports activities, she was also a true Red Sox and Boston sports fan. Sophie was a dedicated member of her community, always welcoming family, friends, and neighbors who never left without Tupperwares of Polish food. Grandmaster of cribbage, she also offered merciless lessons in Scrabble until her final days. Until her recent illness, her daily toe-touches, mile-long walks, and crosswords kept her living independently and driving her yellow Mini Cooper. Never demanding, and always appreciative, her engaging personality, selfless-ness, and devotion inspired all who met her. She is survived by a daughter Barbara (Swiercz) Tillman and her husband Joel, two sons, Anthony Swiercz and Barb, as well as Alan Swiercz and Cathy, three grandchildren, Elena Tillman, Paula Swiercz and Michael Swiercz, and many nieces and nephews. She is survived by sisters Louise Bartos and Joanna Hayes and is predeceased by Stella Szynal, George Plaza, Anthony Plaza, Michael Plaza, Veronica Moulton, Joseph Plaza, Genevieve Zak, Edward Plaza, and Lorraine Cislo. The family would like to thank the doctors, nurses, and all of Sophie’s caretakers at CooleyDickinson Hospital and Bay State Medical Center for their outstanding care and support. Calling hours will be held at Graham Funeral Home at 18 Adams Street in Easthampton on Monday, January 14th from 4-7pm. Funeral services with Military Honors will also be held at 10am on Tuesday, January 15, 2019 at Graham Funeral Home followed by burial services at Saint Stanislaus Cemetery in Easthampton. Family and friends are welcome to the celebration of her life directly after. In lieu of flowers or donations, the family requests that a kind act be rendered in Sophie’s memory.